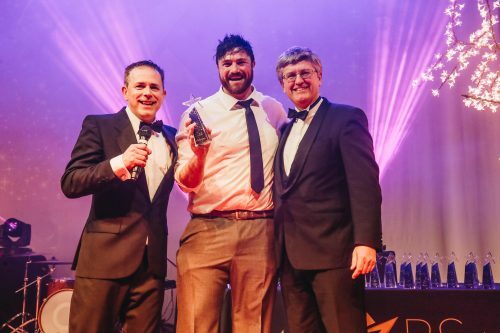 The winners of the inaugural 2019 BH Star Awards were announced at a glamour-filled, glitzy gala awards’ ceremony held at The Lighthouse, Poole on 14thMarch 2019. A fabulous, fun-filled celebration of tourism, business and retail at its finest, the new BH Star Awards were extremely competitive, drawing entrants from throughout the BH post code area across 25 categories. Finalists were treated to a spectacular display of entertainment by The Benedicts whilst creative catering was provided by Dorset-based Molecular Magic. A vibrant and creative approach was used to launch and publicise these new prestigious awards, something which appealed to entrants and supporters alike. The award categories included dining experience, hotel and self catering accommodation, new business, innovation, activities, retailer experience, green initiatives and more. Ward Goodman were sponsoring the Community Award, a very competitive category with a diverse list of finalist including Bournemouth Rocks 2018, Bourne Free, Bournemouth University, Dorset Foodie Family, Ellis Jones Solicitors, Frankenfest 2018, Highcliffe Action Team, Hays Travel Southbourne, Poole Bay Rotary Club, Poole Hill Brewery, Shelley Theatre and Wave Project Dorset. The awards were also supported by other sponsors and partners including: A-One Insurance Group, County Foods, Country Fare, Mploy, Goadsby,, Meridian Lifts, Meridian Air Conditioning, Oceana Hotel Group, Sandown Mercedes, Nativ, Ist Waste Management, Daily Echo, Wave 105, BoHo Beach House, BC Nutrition, ELIS, Templar Wines, Conker Spirit, Amica and Expect Best. Jackie Phillipson, co-founder of ROUTEpr and Events, organiser and curator of the Star Awards, said: “The value of winning, kudos and related publicity mean that winners have something to shout about as they return to congratulate their teams. The judges were impressed by business growth and development, but we must say well done to all entrants, semi-finalists and especially, tonight’s winners. The organisers announced a new award: The Robert Braithwaite CBE,DL Apprentice Award which has been created in his memory for the founder of Sunseeker International. Robert was a firm believer in the power of apprenticeships and anyone who worked with him will understand the significance of this award in his memory.